There’s too much bread in Jesus’ life for it to be a mistake. Before He served His disciples bread saying “this is my body” at the Last Supper, or declared Himself the bread of life, Jesus was feeding the five thousand with two fish, and five tasty loaves. He was born in Bethlehem, a town that literally translates to “House of Bread”, and given that so much of his life revolved around baked goods, I double-checked He wasn’t crucified on a hot cross bun. Sourdough is baked from dough that’s gone bad. Around 1500BC the Egyptians discovered that if you leave a mixture water and flour out for long enough, it starts to ferment, developing a culture of lactobacillus — your sourdough starter. The bacteria will cause the bread to rise, not from any added yeast, but from “wild yeast” that comes from the air, the heavens, around it. While these bacteria won’t turn the water you add to wine, they will metabolize the starches in flour to lactic acid and an alcoholic home-brew, and when baked, the loaf will have a delectable sour flavour and chewy crust. The older the culture is the more distinctive the sourdough flavour will be, so long as it has been loved and cared for with a daily refreshment of new water and flour. Sourdough, after all, is a living thing. Gift a biologist a bubbling batch of your starter, and they’ll thank you for the Saccharomyces cerevisiae (which also give us beer), Lactobactillus bulgaricus (active in yogurt), and Lactobactillus sanfranciscensis, among many others. Sourdough, like Jesus, is the bread of life. L. sanfranciscensis takes its name from the modern mecca of sourdough, San Francisco. A smash hit with the 1849 gold rushers, sourdough followed the rush up into the Klondike, and became a part miner culture. The term sourdougher came to mean “experienced miner” as a sourdougher would sleep with their starter in their sleeping bag to protect it and keep it warm. Curiously, bread baked from the Klondike starters tasted different than bread baked from Californian ones, as the environment the starter is raised in determines its culinary character. Many factors, including the climate (especially heat and humidity), the type of flour fed to the stater, and the timing of feedings, make the bread of the Golden State taste different than that of the Yukon’s, or anywhere else’s. This got me thinking. What’s all a part of the environment? Does it include the baker? Do we host the same bacteria in our bodies as a sourdough starter? What if some of the trillions of bacterial cells that hitch a ride on our bodies became part of the active culture in the sourdough loaf? After sleeping with their starters tucked so close, could a small microbial part of a miner become a part of the starter? Could that bacteria reproduce, and thrive, living eternally? Do I have any bread left in the pantry? Is the bakery still open? Is Jesus alive in a sourdough loaf? He very well could be. The same strains of bacteria that make sourdough sour are found in our bodies. In fact, there are ten times more bacteria cells in our bodies than human cells. By head-count we’re more bacteria than we are human, and we couldn’t live without them. The chance that one of those hitch-hikers might slip into a starter, and reproduce and live eternally? That a microbial part of Jesus might be living in one of his doughs? Entirely possible. A baker’s dozen attended the Last Supper, twelve disciples, and Christ himself. What was on the menu? Bread. Taking place during Passover, no leavened bread could be eaten, so sourdough was unfortunately not possible even though it doesn’t require any added yeast (what a shame). Instead Jesus offered the flatbread, curiously saying “this is my body”, predicted that one of his Apostles would betray him, and was crucified the next day. 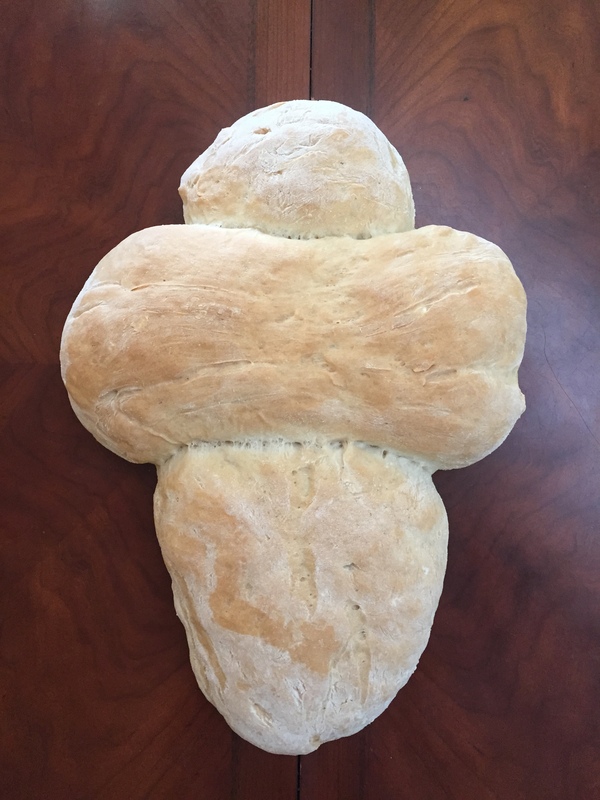 But, if a little dough was left over, and Christ himself had handled it, if it was cared for and nurtured, and allowed to sour with the same bacteria that was a part of Christ, it would become delicious, and most importantly, you could literally eat the body of Christ. Jesus Christ could still be living right now in a goopy dough, and blessing the palates of the fortunate when they eat their daily bread. Like Jesus, sourdough is a miracle worker. Not only does it perform a disappearing act on my plate, the sourdough culture reduces gluten, and research has attempted to make a bacteria culture that, with suitable fermentation time, could make a wheat based bread suitable for celiacs. A secret dough, kept safe for many years, would be the ideal for anyone to experience Him. While many have chased the Holy Grail, few, if any, have followed the dough. So calling all bakers and breadheads, Christians and conspiracists for a new quest: the Holy Starter. Seek it, or prepare it yourself. If the dough rises without yeast, and is tangy and bakes with a heavenly, chewy crust, then it may be He who has risen.